Cape Cod, an arm-shaped peninsula (actually, technically an island since it was "divorced" from the mainland in 1914 by the opening of the Cape Cod Canal) is less than an hour from Boston and one of the world's great summer playgrounds. It's famous among gay travelers for its outermost community, Provincetown, but Cape Cod is actually gay-friendly from end to end, with a variety of eclectic communities offering everything from a wealth of art galleries and sophisticated inns to great biking and fishing. Gradually, gay visitors are exploring other parts of the Cape as well as the famous nearby islands, Martha's Vineyard and Nantucket. Cape Cod is roughly 400 square miles. It's shaped roughly like a curled arm, with the largest and most populous section nearest to the mainland and known as the Upper Cape. As you progress further east and away from the mainland, you come to the Mid Cape and Lower Cape, and then as you head north, the narrowest and farthest-away section is the Outer Cape—at the end of this section, you'll find gay-popular Provincetown. There are numerous GLBT events that take place in Provincetown, the eclectic Portuguese fishing village at the very tip of the Cape that has been attracting members of the gay community since the early 20th century. The town itself is very gay-friendly, featuring many welcoming inns and B&Bs, and restaurants bars, and clubs. There are a few organized events, including Provincetown Bears, a 9-day/night continuous party in July featuring beach outings, pool and dance parties, and leather events. Also in July is Girl Splash, a week for women where they can "hold hands without a second thought." In August, Carnival Week takes over the town, the highlight being the parade on Thursday. Each year brings a different theme and residents, as well as visitors, dress up accordingly throughout the week. And summer itself is filled with colorful cabaret, drag shows, theater, and concerts and comedy shows at the Provincetown Town Hall. Cape Cod is divided into four geographical sections based on if the land mass were an arm—so it may seem opposite from what you'd expect, but if you picture the arm extended (versus poised as if it were flexing a muscle) it will make sense. The Upper Cape is the section nearest the mainland; the Mid Cape is next and is basically the rest of the bicep and triceps; the elbow of the arm is the Lower Cape, and the remaining arm and fist are the Outer Cape. 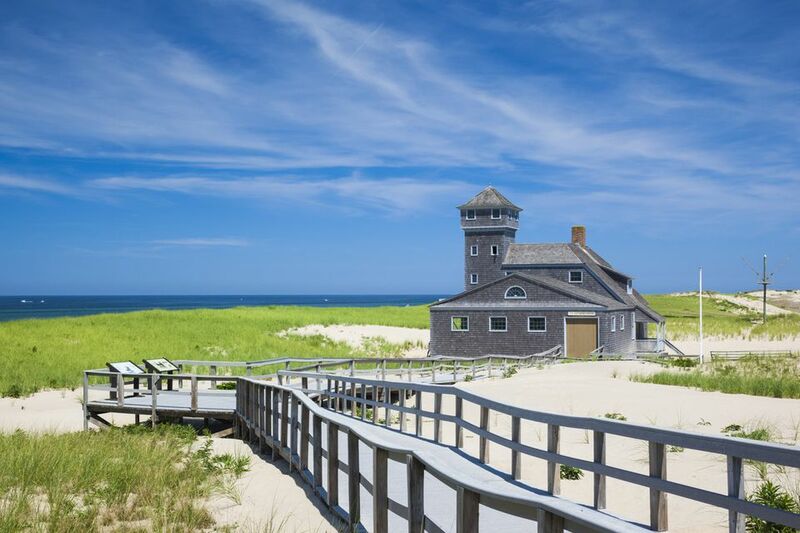 Although the Outer Cape, because it's home to the famed gay resort of Provincetown, is most popular with GLBT travelers, each section of the Cape has its charms and worthy attractions. The most noteworthy communities on the Cape include Sandwich, Falmouth, and Woods Hole on the Upper Cape; Barnstable and Hyannis on the Mid Cape; Chatham, Brewster, and Orleans on the Lower Cape; and Wellfleet and P'town on the Outer Cape. Each town on Cape Cod has a very good chamber of commerce with its own website, but you can also get plenty of general information on the region from the Cape Cod Chamber of Commerce, which can help with accommodations, sightseeing, transportation, and other travel assistance. A good resource on gay-friendly businesses on the Cape is the Cape Cod and Islands Pride Pages. In Provincetown, look to the Provincetown Business Guild for tons of great information on gay travel. Scenic, artsy, and generally liberal, Cape Cod has long been a popular place to vacation and live among gays and lesbians. Provincetown, for good reason, gets much of the attention with the GLBT crowd, but the entire Cape actually has plenty to see and do. Certain areas are a bit more geared toward kids and families than others, particularly the somewhat built-up stretch along Rte. 28 from the east edge of Hyannis through Yarmouth, Dennis Port, Harwich, and West Chatham. There are a few towns on the Cape, beyond just Provincetown, that have quietly developed increased cachet in recent years. In the Upper Cape, both Sandwich and Falmouth have inviting commercial districts and great restaurants. Falmouth, in particular, makes for a terrific weekend getaway and is also a wonderful base for making day-trips to Martha's Vineyard. Excellent gay-friendly lodging choices in the area include Falmouth's stately Palmer House Inn and Captain Tom Lawrence House, and Sandwich's historic Inn at Sandwich Center. In the Mid Cape, the bustling town of Hyannis—with its extensive ties to the Kennedy family—has a vibrant downtown with great dining and gay-friendly pubs and bars. Just north in Barnstable, scenic and charming Rte. 6A runs through Yarmouth, East Dennis, and Brewster, passing by dozens of antique shops, cafes, and galleries. If you have the time, it's the most enjoyable route across the Cape. Highly recommended gay-friendly accommodations include the gay-owned Captain David Kelley House in Centerville, Lamb and Lion Inn in Barnstable, Brewster's historic Captain Freeman Inn, the Captain Farris House in South Yarmouth, and the romantic Sea Meadow Inn in Brewster. The Lower and Outer Cape communities of Chatham and Wellfleet are particularly charming for shopping, dining, and exploring nature, and quiet and scenic Truro is a great spot that's super-close to Provincetown but completely peaceful. Chatham has something of a conservative reputation, at least as Cape Cod goes, somewhat akin to blue-blooded Nantucket, but accommodations here are still perfectly gay-friendly. Wellfleet is a bit artsier and extremely secluded, it being the last community with a bustling downtown center before you reach Provincetown—you'll find a slew of excellent art galleries here. Gay-friendly accommodations in these parts include Eastham's luxurious Penny House Inn, Orleans's sunny and bright Little Inn on Pleasant Bay, Chatham's lovely and gay-owned Chatham Gables Inn, Wellfleet's rambling and historic Holden Inn, and the Crow's Nest Resort & Cottages and economical Cape View Motel, up in North Truro, quite close to Provincetown. Provincetown, of course, is still a winner when it comes to its dynamic, exciting gay scene, but don't overlook the rest of Cape Cod. Although Cape Cod is more popular in summer, and many of its businesses close off-season, it's actually appealing year-round, especially during the less-crowded but still mild spring and fall. Generally, the towns closer to the mainland remain the most popular year-round, among them Falmouth and Sandwich. Climate varies depending on where you are on the Cape. Mid Cape, averages are 37 F/21 F in Jan., 52 F/38 F in Apr., 78 F/63 F in July, and 60 F/44 F in Oct. Snow falls occasionally in winter, and summer breezes generally prevent extended heat waves. Fall and spring offer crisp, cool, and often beautiful weather. Although a car is handy for reaching the Cape and exploring different parts of it, in summer the traffic is horrendous, and a car can be a liability. The Cape has excellent public transportation, both to and around the region. You can fly into the region's major airports, such as Providence's T.F. Green Airport, and Boston's busy Logan International, which are both about an hour away from the Cape. Or fly to the Cape's own Barnstable Airport, which is served by Cape Air (from Boston and with service to Martha's Vineyard), Island Air (with service to Nantucket), and Nantucket Airlines (also with service to Nantucket). The Cape is well-served by Peter Pan Bus Lines, Cape Cod Regional Transit, and Plymouth & Brockton bus lines, plus numerous ferry services. Brewster: Cape Cod Museum of Natural History, Cape Rep Theatre, Nickerson State Park. Chatham: Shopping in downtown Chatham, Monomoy National Wildlife Refuge, Monomoy Theatre.